With the end of Thanksgiving, it’s clear that the winter holiday season advertising is on full blast, as businesses deck their walls with holiday lights and wreaths. How can small businesses market during the holiday season? The winter holiday is all about giving – so why not use this time to give back to the community? Pick a charity and propose a partnership with your customers. For every new dental appointment scheduled during the holidays, you could promise a contribution from the business to the charity. Or gather your employees and volunteer at the food shelter, showing your customers your commitment to giving back. Another idea is to have a donation box, a canned food collection for example, at the office or shop that both customers and employers can use to help out. Customers always like special discounts and promotions! Why not start a “12 Days of Christmas” campaign, where you can give a discount on a different product every day of the sale? You can use social media platforms such as Facebook and Twitter to market these campaigns and spread it among your customers. Another way you can reach your customers is to create an e-mail campaign with the above promotions included. Connect to your customers with a personal touch by sending them a holiday greeting card. A study by 99designs showed that nearly 73% of customers look forward to receiving holiday greetings. This is also a chance to tell your customers what you’ve been up to, from expanding business locations to community volunteering. To reach out to your wide customer base, keep the content short and simple, without using any specific holiday or religious terms. You don’t want to risk offending any of your customers! Although e-mail holiday cards are an option, 58% of customers prefer snail mail to email. If your customer base is small, try to add a personal touch by customizing the cards for the customer. Along with your holiday promotions, you could also host a contest on one of your social media platforms. Ask your followers on social media to submit their best holiday outfit with a custom hash tag that you set. At the end of the submission dates, pick out the best one and offer a prize! Posting collages of the best submissions can also increase customer interaction. Another easy campaign is to start a “share-it to win-it” campaign! This can easily be implemented across social media like Facebook, Instagram, and Twitter. Ask your followers to share your post that will enter them into the giveaway. If you create a giveaway campaign on your website, you can also collect new customer e-mail addresses! Is it cold and blistery in your city? Stocking up on hot chocolate and warm beverages at your office can keep your customers happy and comfortable. Adding holiday decorations to the office can also cheer up your customers’ day and change up the atmosphere. Not only will you make your customers happy, you might find that holiday cheer can brighten up an employee’s day as well! Regardless of what campaign you choose, the holidays are a great time for small businesses to market! 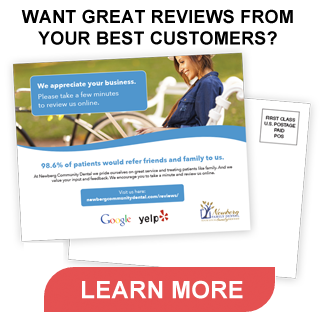 Use this time to thank your loyal customers and invite new customers to try your business.